Our friends at DARPA are at it again with a Cognitive Technology Threat Warning System. 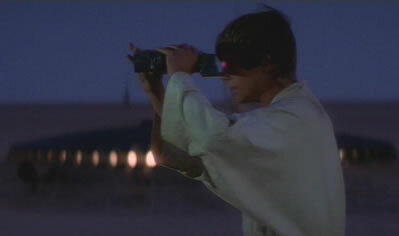 They've dubbed the device "Luke's Binoculars," after the device used by Luke Skywalker in the original Star Wars movie. I only hope they work better than the originals; it didn't seem to me that they sometimes presented staticky results. No wait, there are Sand People down there. DARPA wants to do more than eyeball Banthas and Sand People. The intent of this government program is to see if there is some way to use an EEG scan of the soldiers brain to help alert him to potential threats that he picks up subliminally. It turns out that there are fast neural signatures associated with target detection in natural imagery. Recent developments and discoveries in the disparate technology areas of flat-field, wide-angle optics, large pixel-count digital imagers, cognitive visual processing algorithms, neurally-based target detection signatures and ultra-low power analog-digital hybrid signal processing electronics have led DARPA to believe that focused technology development, system design, and system integration efforts may produce revolutionary capabilities for the warfighter. The final objective of the DARPA CT2WS program is the development of prototype soldier-portable digital imaging threat queuing systems capable of effective detection ranges of 1-10 km against dismounts and vehicles while simultaneously surveying a 120-degree or greater field of view (FOV). So, until DARPA can actually culture soldier's brain cells in a dish and use their natural abilities to the max (human neurons are a system with a slightly longer development lead - about 500 million years), they'll settle for using EEG to look for that edge in threat detection. Don't laugh - we are getting closer to sf author Peter Watts' head cheese; see Rat Neurons In A Dish Now Playing Flight Simulator for a foretaste. Read more about Star Wars Binoculars at Wired.